Here’s hoping I don’t spend the first day the game is out staring at the character creation screens. Isn't that always the first day? Recreational Villian is living up to his name LOL. I love my PoF 1 monk and want to continue as that class, so the paladin multiclass build looks fun. My background could be Palliegina (my new BFF in my current walkthrough) cross-trained me. I was also thinking cipher/monk or ranger/monk looked promising as well. Both are easily explained from a role play perspective - I either developed cipher powers as a watcher or I went into exile between the two games and became a survivalist. Cyphers - does soul whip count as melee or ranged for disruption? Monk Helwalker - more wounds to start and +str for each wound. The high endurance of barb should offset some of the increased damage taken. Monk Pillar - same benefits as for any other class. This combo basically adds monk spells to a barb. Paladin Goldpact - does the mage slayer penalty effect the gold shield? If so then no go. If not then woo! Ranger Ghost - pet is immune to engagement and no bonded grief... They may create a situation where the pet can get to mages where you cannot. @ jdzappa - hah! My first escapade through an accommodating RPG is usually as a double-crossing Jerky McJerkyson. On the flip, I typically pair that kind of main with companions like Edér -- I suspect the poor lad had an Excedrin habit by the time we were done. @ fangblackbone's mage slayer/x musings: rogues for the 'dirty fighting' choice, fighters for the similar skill of grazes to hits(?) plus the accuracy (approx 15 seconds base, iirc), and paladins all strike me as decent. Athletics' [of decent level] per combat adrenaline health shot may be on shorter delay than lay on hands anyways -- and I'd forgo LoH for something else regardless. edit: (way later) changed to "+10 size" instead of "+10 range" as we aren't talking about deflection of ranged attacks but rather in-the-range or of the size of +10. With the ship stuff, it might be enough to sway me away from doing that. But I may not be able to help myself. And with multiclassing, I can see myself doing it at different stages in the campaign based on needs. I am also curious with how soloing is addressed with the ship stuff. edit: have to admit I am a bit bummed regarding the familiar being a random summon. It seems to defeat the point it they are no good in combat and provide an unreliable buff. Cheap jabs aside, after the first run I sometimes go the Icewind Dale-alike route so I can build the entire team too. As I understand it, 'most' of the ship crew stuff is separate vs your adventuring party. Though I believe when you board an enemy vessel, for a fight, you get any (healthy?) ship crew plus your party. Ship crew have a cost associated with keeping them on. to clarify: the familiar is (was?) random as to type but they may all instill the same buff stats in the caster. I'm unsure how well they will scale up over the course of the game. I suspect if they bothered to make the familiar random that it may rank up in the pool it is drawn from.. ..I would certainly prefer to pick the familiar at the start of the game. I hope that's the case in final, but I can understand if they reserve that perk for rangers. I can also see where it shouldn't be as tough for balance reasons. Well its not like the conjurer losing evocation spells (and illusion!) is that big a deal... Yeah, I did not say that with a straight face ;P I could have sworn I saw a video with a mage with a pet that looked like a golem and not just a familiar. Re: ship crew - it looked to me from the videos that your party manned your ship and had differing ship strengths and responsibilities. If they have distinguished between party and ship crew then terrific! Re: custom companions - I just loved the fact that I can run solo, duos, or trios, and also the madness that is 4-6 rangers + pets! Can you imagine ship boarding with 6+6 rangers/pets? From what I've seen in the beta, this game is going to eat you alive, Fang. Anyone with a yang for trying different class combos and party compositions really. Making dual-classing a thing is mean. Damnit! I want to get passed the first hour of the story... Some day, some day. I think it may be more of an issue of "hurts so good" than "mean". Unless I am part of some video game/Truman show social experiment I didn't know about. To further clarify (and muddle) I'm pretty sure that the few familiars I ever saw, while randomized, all imparted a deflection bonus... just the smaller, other, bonuses may be randomized per critter. I was building for deflection. As you level up, I wouldn't be surprised if the summon pool levels up and possibly as far as a golem or elemental type critter. Losing 'other' spell school on specialist wizards struck me as very BGII, but they each had a nice bonus and you cast your chosen class with a higher power level, iirc. As a single class wizard I'd go non specialist and use a lot of grimoires. For a melee/mage hybrid I'd definitely commit to a fewer spells though, and in turn a specialist class and not equip a grimoire in the off-hand. It's possible that the party can be swapped in for the unique ship crew slots... but that strikes me as iffy since you'd have to remember to always refill a ship assignment slot if you changed up your party and I could see events where you get back to your ship and some event happens that is played out by who you had as your ship team. The ship crew options all have flavor and not just 'pirate x', so you may have seen a video where they just looked like party members? They struck me as very unique between each other, to the degree that they might have some story hooks. Crew definitely had a 'cost' that you had to pay recurring wages -- I think this was the same with the Cad Nua hires in the first game? These seemed to have, er, a boatload more personality though. As to the last, I don't think there's a lot of race/class restrictions -- at least, with gear? Pretty sure I backstabbed with a big two-hander once (separate from just sneak attack strike damage which triggers whenever an enemy has an affliction, flanked, or within the first few seconds of combat) and my Speederella test was an elf with dual pistols as a barbarian/x variants using frenzy for the speed burst instead of melee. To take that one step further, one of the last backer builds changed it where you could use non-proficient weapons without penalty; you just couldn't use the weapon's ALT mode if you didn't have said weapon type proficiency. In short, each weapon can be toggled into this alt mode. This generally has a malus (often slower speed, but not always iirc) that you exchange for some benefit such as higher deflection, interruption, better piercing, bleeding effect, faster shots etc. Every single weapon type had an alt mode that I saw including for small, medium, and large shields (I forget the game's term for said alt mode). 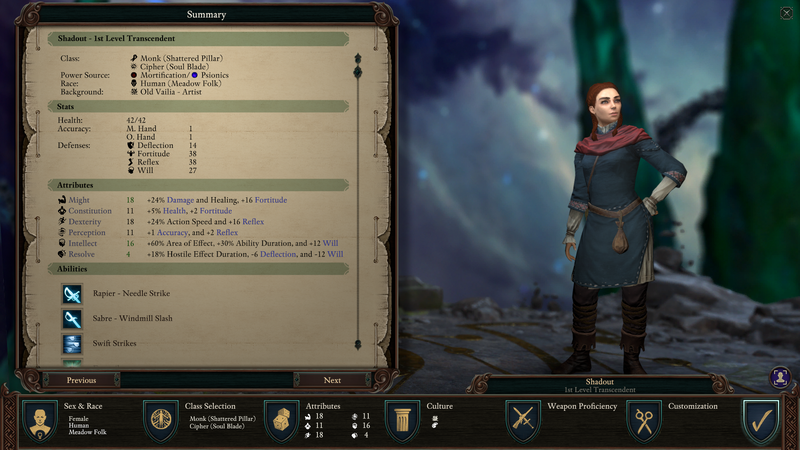 Pillars of Eternity II: Deadfire seems an order of magnitude superior to Pillars I, which I felt meandered about in various ways or had overall weak identity. Reminds me of the, widely held --and I'd agree, consensus that BGII was that much better than the rough and/or bland areas of BGI. I am still afraid I can only be disappointed bye PoE2, due to too high of a hype level. Why can't it be Tuesday? Maybe? We're all getting jaded, 'eh? They seem to be going all out. Full VO, better animation, multiclassing, retouched/redid most of the main character VO choices (plus I think they have some deal with Critical Role in that regard), options for setting characters idle state pose, combat revamp (I love being able to retarget a fireball when I'm 3/4 of the way through the cast animation without canceling then re-casting from scratch). Tons of other little QoL touches. Plus sailing around on your ship may be a good compromise if they are still not giving xp on monster kills. It seems a way of growing your characters without forcing you to progress in the story. You don't have to multiclass and single class characters can gain higher power levels and more abilities. Single classes gain powers every 2 levels. Multiclass earn powers every 3. Level cap is 20 to the best of my knowledge. So 1,3,5,7,9,11,13,15,17,19 vs. 1,4,7,10,13,16,19 but I have heard it is the ability to get rank 8 vs rank 9 powers. 1,4,7,10,13,16,19 would give you 7 ranks, which I believe meant no rank 8 or 9 at max (as opposed to having 8MC vs 9SC). Then again, they made some MAJOR changes ~ March 27 -- and I believe more tweaks thereafter. I assume even more after the last backer beta. NOTE: at one point the staggered every-x-levels/ 'power level' was not the same as when you 'gained powers'. You could pick a power every level (both SCs and MCs). Periodically a MC would get to pick a skill(spell, etc) for each class as opposed to most levels when you had to decide which class got the new skill. A bit more iffy: 1,4,7,10,13,16,19 may be when the 2-pick landed. The BB area was capped to available XP well below char lvl 19.
edit notes: I think for a MC it counts level 1, so 1-3-6-9 as opposed to 1-4-7-10. This seems to track for 1 and 3 at least as I can pick a kit, and still get a 2-pick (one each class, at 1 and 3) whereas at char lvl 2 there was onle 1 pick so I had to decide which class to skill up. I guess we will see because that is making my brain hurt this early in the morning. The game is now available to pre-load on Steam. Tell me this opens at midnight?! Well, off to a good start. Game launched fine first time, after that the monitor turn black every time, and no way to get out other than turning the PC off. Game music is still playing in the background, can even hear that menu clicks get through. Oh well, what is a small 20GB download all over again. The crash is very similar to another one I had earlier this year with Dishonored 2: Death of the Outsider. Wonder if Steam is the problem. Don't tell me that. I had that problem with Wolfenstein 2 and just put it back on the shelf. Reinstalled graphics drivers and reinstalled the game. Fixed nothing. But I tried Alt+Enter this time and it brought the game back - with low resolution and twisted aspect ratios - so I could get into the menu and turn on windowed mode, which seems to have saved it. Really frustrating issue though. Was extremely close to giving up on Dishonored back then. Alt+Enter also had some effect then, but only for like a split second each time. Sounds like they need a /safemode launch option if they don't have one somewhere. I may play in windowed mode if that can avoid this. Character creation boss is tough. Don't make me choose, it hurts. They seriously added more stuff you have to decide at the very beginning, because it wasn't hard enough in the first game. Played a bit at lunch. So far, sliiiiiiick!